Sorry it took me a while to let you guys know who the winner of the contest is, but they were nominated and I had to make sure it was okay to post their story on here! Gabby and Julio are the proud parents of 3 beautiful girls! They are an amazing, fun, outgoing, adventurous family that inspire me in so many ways. You see, J was born with a rare disorder that affects the way her body grows. Because of this J has lost the ability to walk and to speak and eat normally. She is such a fragile little lady that she has had to spend lots of time in and out of hospitals and Dr.'s offices. What is so incredibly amazing about this family is that they do everything in their power to treat J like a normal 14 year old. All of them join together and help to take care of J. While in a wheelchair, J still goes everywhere with her family! The beach, amusement parks, family vacations and anywhere else they can have fun together as a family! What I love is that these parents are determined to show their girls the world and teach them that there are no obstacles in life that you cannot break through. Nothing in life that can stop you from experiencing the joys that being a family can bring. Since they are such wonderful parents, Gabby and Julio are also very protective of their girls. Especially J. People can be so judgemental now days. So harsh and so inconsiderate. Because of this, it has been difficult for them to trust someone enough to take family photos for them. Someone that they feel comfortable with. Someone that they know will see J for the beautiful, kind, funny girl she is. J will be turning 15 this coming fall. There have been many times when Gabby and Julio thought they would lose their daughter. Many times when they hoped and prayed should would make it to 15. They are so grateful to be able to celebrate J and her Quinceanera this fall. That is why I am nominating them, in the hopes that they can finally have the family photos they deserve. With caring, understanding, warm hearted photographers like Nataly and Art. I could not think of anyone else I could trust more to capture this family than Nataly Lemus Photography. Thank you for the opportunity to enter your contest! Now, I know I said get creative with the photo and all that and there were some AMAZING photos which I thank you all who entered for. The stories that went with the photos were also touching and super special, every single one, but at the end of the day, the Trujillo's photo might not have out beat many of the photos you guys e-mailed us (as far as creativity) but their story truly touched our hearts. That was what it was all about and I am very happy they were nominated. I didn't want you think I just disregarded all the amazing work some of you put into the contest., because we totally appreciate all the hard work you put into your photos and how open you all were with your stories. Thank you so, so, so, so much! We feel that nominating someone was very selfless. 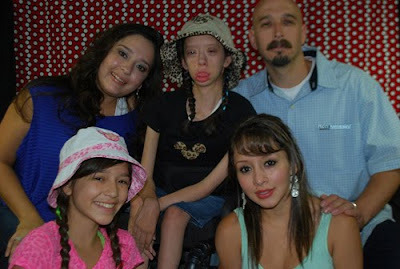 Elena could very easily have entered her family but instead she opted to do something wonderful for the Trujillo family. We are very happy they were nominated and can't wait to give them beautiful family photos that they can cherish forever. I want to thank all of you who entered and tell you that we enjoyed reading your stories and seeing your photos! I definitely have to put my top three on here! You guys have mad skills! I was so amazed at the response we got. We definitely need to host another contest soon! Congrats to the Trujillo family! I couldn't think of anyone better to capture J's 15th. Many blessings to the family and also to Elena for her selfless nomination. Wow! I am in tears! Elena has such a big big heart! Congrats to the Trujillo family! Hello everyone. My name is Gabriela. I am J's mom. I appologize for not posting sooner. The weekend we found out we won the photo shoot contest, we left out of town, and I had no internet connection to express our thoughts sooner. Anyway, I would like to start off by saying that I've had the pleasure to follow Nataly and Art's beautiful work. I first visited Nataly's blog when I was invited by Elena to see her family pictures. I must say, that I was amazed at the work that they do. I loved the pictures so much, that I had to share the blog with my family. I feel that Nataly and Art have a unique magical touch in what they do. The pictures are so clear, and have such beautiful vibrant colors that pop out at you. I can compare them to perfect pictures out of a magazine. When I first saw their work, I thought, I would definetly love to have them shoot our family, and mainly our be-loved J.
I am so greatful that God has put such a beautiful person like Elena in our path, and lives. I was so honored when she called me and told me that she wrote out a nomination for a free photo shoot from the Lemus's, and asked if it was okay with us for her to post it. With out a doubt, I agreed. I never even asked what she wrote. I was so honored, for Elena to view us in such a way, and acknowledge us, to take the time to nominate us. A million thanks to Elena, who'm has had her challenges of her own, with M. From one mother to another. -Thank you. XoXoXo. Now, I would like to take a moment to tell you a little bit about J. She was born in November 1996. She was born with 2 syndromes that are totally un-related. Williams Syndrome, (deletion of chromosome 7) and FSHD (facio scapulo humeral dystrohy) wich is the deterioration of the muscles. We never realized anything was wrong with her during birth and pregnancy, except for her being born with a heart murmur. As time went buy I realized that her developmental skills were severely behind. God allowed us the privelage to see her walk, but about 2 years later, her muscle tone started deteriorating. What's ironic in J's case is that even though she has her disabilities, she is a very bright little girl. It amazes me every day to watch her grow. Her personality is totally 14. She started acting like a teen since 12, -lol. I guess I can say that she's very mature for her age, considering that when little kids used to run around, she would hang out with the teens and grown ups, who'm would stay seated. J is one of the biggest blessings I've received in my life. She and her 2 sisters. I beleive that J. was put on this world to teach us, not for us, to teach her. When many of us can complain about a bad day, something as small as a splinter on our finger that's been bugging us, etc. J, has been through many challenges in and out of hospitals. The last time she was hospitalized, she was incubated. It was the worst time of my life, yet, while being next to J, She would carress my head, for condolenses. She feels when I'm happy, sad, mad, etc. Most of us worry about ourselves, she worries about everyone around her. She will be the one to notice, and ask when someone is missing. She amazes me every day, to see that with all her challenges, she only focuses in loving us, and making us laugh. I am truly blessed that God have me a wonderful husband, who'm has been there for us, and has been the greatest dad for our daughters. He has always done everything and anytthing, for J. Her sisters, love J unconditionally, and help out with her needs as well. They all have so much patience, and love for J. With all this said, I would like to thank Elena for acknowleding us, from the outside. and for Nataly and Art to have such big hearts to have such a contest like this. We are truly very excited and looking forward to the photo shoot. -Thank you all. God Bless Nataly and Art for this contest and such an inspiring life story from the Trujillo family! Many blessings and happiness to both families!! Don't forget to post some of their beautiful family portraits! It is so awesome to see Nataly and Art do such a heartfelt contest and congrats to the Trujillo family for winning! They truly deserve it! Don't forget to share a few of their wonderful family portraits and many blessings to both families! I am inspired by both the act of kindness by the photographers as well as the strength displayed in the Trujillo family!